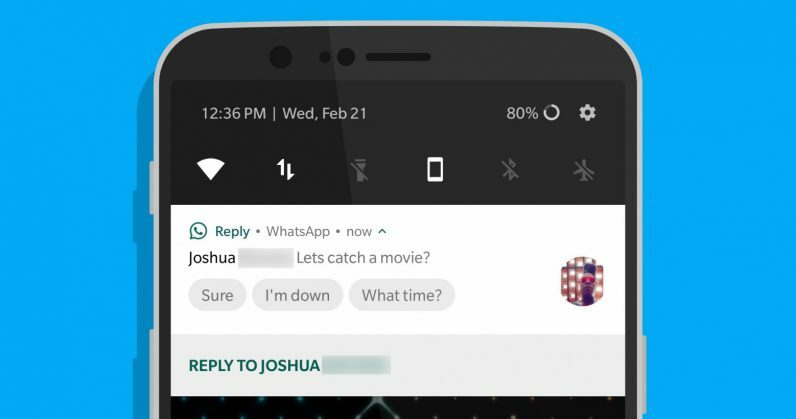 Last week, we heard that Google was working on Reply, an AI-powered app that lets you reply to texts from various messaging apps by tapping on contextually meaningful replies right in your notifications. I just sideloaded a beta version of it earlier today, and it already looks pretty promising as an assistant that helps you text faster. Once you’ve installed Reply on your Android device and granted it the necessary permissions, the app will take over notifications from services like WhatsApp, Twitter DM, Hangouts, and Slack, and add buttons labeled with responses; tap one and it’ll send it out instantly. Essentially, it negates the need to type out responses to straightforward messages and questions. If you’ve tried Smart Reply in Google’s Inbox and Gmail apps, this will feel familiar to you. As Android Police noted, some features that we heard about, like responding with your exact travel time to a location, don’t yet work; however, this is still a beta build and it’s safe to assume that such niggles will be sorted before Reply is ready for prime time. Besides saving me the effort of a few swipes on my keyboard, it also seems like it could kill my texting paralysis – that occasional inertia I experience when trying to think of what to say, or whether I’m saying it the right way. Whether Reply will kill off the art of textual conversation is a matter for another piece – but for making plans, confirming your presence at an event, and answering basic questions from your contacts, it’s a real time-saver. Google’s getting fairly good at this ahead of the competition, so it’ll be interesting to see if rivals build their own AI-powered tools for the job, or if Reply will be around for a while and continue to evolve. Grab the Reply beta to try out yourself from APKMirror.